We add SEO to your webs pages so that the Search Engines can find your site with ease when your customers are searching for them and help increase your Google rankings, website visitors and we include this in your site for no extra cost - all our sites appear in the top 5 searches on the most popular search engines. Looking after your site and keeping it on-line, we can provide you with domain name registration, or bring along your own if you already have a domain name registered, website analytics, content management, spam filtered email and E-newsletters… all included in your price package. Just a collection of some of our latest work for a variety of clients. Holly Mae is a new, upcoming, professional freelance makeup artist based in Sheffield, South Yorkshire. After completing her Level 3 Diploma in Hair and Media Makeup, she specialises in Bridal, Prom and Evening makeup, transforming her clients into a more glamorous and confident version of themselves. AJ Racing are stockists & suppliers of Karting components, covering both World Championship winning karts and engines. All products in our online store will be available to purchase via mail order, telephone or can be pre-ordered at all NKF Meetings. 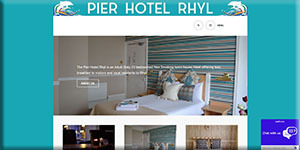 The Pier Hotel is an adult only hotel in Rhyl, North Wales, but don't let the term "Adult Only" put you off, this only means that there are no children to spoil the peace and quiet of you're much needed break, The Pier Hotel has been honoured in the LateRooms.com Simply The Guest Awards by achieving the prestigious Top Rated status, based purely on 100% genuine guest reviews.